The Tamron 28-75mm f/2.8 XR Di Lens is a relatively small normal zoom lens that delivers good image quality and a wide fixed f/2.8 aperture for a low cost. Pictured above from left to right are the Sigma 28-70mm f/2.8 EX DG Lens, Tamron SP 28-75mm F/2.8 XR Di Lens, Canon EF 28-135mm f/3.5-5.6 IS USM Lens and Canon EF 24-70mm f/2.8 L USM Lens. One of the most notable feature of this lens is the good center sharpness it delivers, with decent center sharpness at f/2.8 and good center sharpness at f/4. I make the center designation clear as corner sharpness is a completely different story. The Tamron 28-75mm f/2.8 XR Di Lens is very soft in the corners. My first copy was dreadfully soft in the upper left portion of the frame. My second copy has very poor right side performance - especially at 35mm. Corner sharpness improves as the lens is stopped down and zoomed out (toward 75mm). But, some corner softness is still present at 75mm and f/8. Fortunately, users of 1.5x/1.6x FOVCF digital SLR camera bodies will avoid the worst of this pain. Note regarding the ISO 12233 test chart sample crops: I was told that I had a bad copy, so I retested the first copy and then bought and tested (a very time-consuming process) a second lens. The results from the second lens were worse than the first. I may go for a third lens at some point, but need to move on to other tasks. There may be better copies of this lens available, but quality control is definitely a concern. In center sharpness, the Tamron 28-75mm f/2.8 XR Di Lens is similar to the much heavier, larger and more expensive Canon 24-70mm f/2.8 L USM Lens. These two lenses swapped wins at various focal lengths - Canon won 35mm and 70mm, Tamron won 28mm and 50mm, and of course Canon won 24mm and Tamron won 75mm. 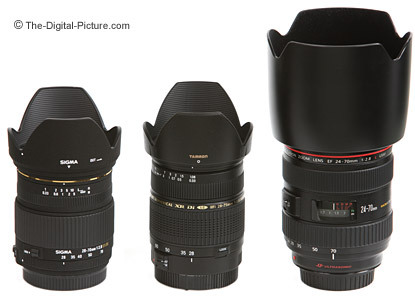 The Canon 28-135 IS USM Lens was generally softer than the Tamron in the center. Moving the comparison out to the image edges changes everything. At the edges, the Canon 24-70mm L is far superior in sharpness to the Tamron 28-75 at all focal lengths and all apertures. At the edges, the Canon 28-135mm IS is slightly sharper than the Tamron 28-75 at most focal lengths and apertures. And nearly all lenses are sharper than this Tamron's top left corner. Again, users of 1.5x/1.6x FOVCF digital SLR camera bodies will avoid most of this pain. I seem to get sharper corners in real life shots leading me to believe the plane of sharp focus is not exactly a plane. I didn't conduct technical tests to prove this point. Distortion in the Tamron 28-75 is typical (not worse, not better) for a decent quality normal zoom lens - barrel distortion on the wide end to 35mm or so and pincushion distortion on the long end. CA (Chromatic Aberration) is well controlled with only slight CA visible at the wide end in harsh situations. Flare is also well controlled. The Tamron 28-75 has good contrast - better than 28-135 IS but not as good as the 24-70 L. The 28-75's yellow/warm cast is not my preference. Light fall-off is very well controlled with exception of strong full frame corner darkening with a wide open aperture - especially at 24mm with some at 70mm. 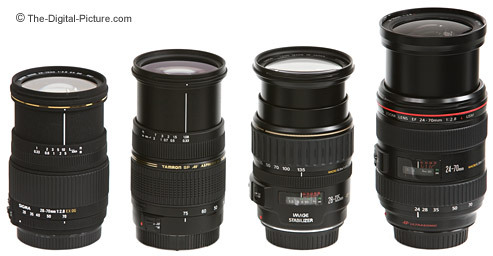 TheTamron 28-75 is better than the 24-70 L and much better than the 28-135 IS in this regard. Seven aperture blades are good, but bokeh appears slightly harsh in some of my evaluation shots. The Tamron 28-75 tends to overexpose most shots slightly with no compensation dialed in. The Tamron 28-75mm f/2.8 XR Di Lens' AF is noisy and somewhat slow. More concerning is the 28-75's difficulty in locking focus in low light/low contrast situations. My Canon 17-40mm f/4 L USM Lens quickly focus-locked in situations where the Tamron only hunted. FTM (Full Time Manual) focusing is not on the 28-75's feature list. Since the focus ring turns during AF (definitely not my favorite feature), focus distances can be (and are) marked on the focus ring itself instead of in a window. The Tamron manual indicates that damage can be done to the lens if the focus ring is held while the lens is autofocusing. I frequently found myself supporting the lens (at least partly) by the focus ring in real use. Of great importance - AF accuracy has been very good. 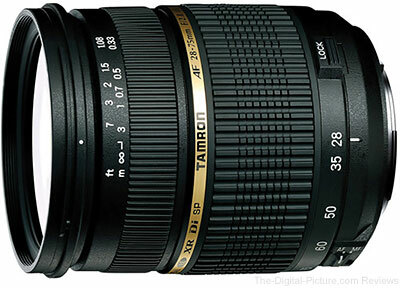 The Tamron 28-75 is an internal-focusing lens. The objective lens does not rotate with focusing or zooming and does not extend with focusing. The Tamron 28-75 sports a decent, solid feeling build quality. The zoom and focus rings are nicely sized and well damped. The rings are not as grippy/sticky as I prefer, but the deeply patterned rubber is not hard to grip. Both rings have a short rotation distance - adjustments tend to be rapid (as opposed to fine). Since I am most often using Canon lenses, I personally find the reverse-direction-rotating zoom ring to be awkward. I zoom in when I want to zoom out. Like most normal focal length range zoom lenses, the Tamron 28-75 extends with zooming. A lock switch is included to hold the lens at the 28mm retracted length. Unless this lens' zoom ring loosens a great deal over time, it is not needed. Pictured above from left to right are the Sigma 28-70mm f/2.8 EX DG Lens, Tamron SP 28-75mm F/2.8 XR Di Lens, Canon EF 28-135mm f/3.5-5.6 IS USM Lens and Canon EF 24-70mm f/2.8 L USM Lens - all shown at their maximum extension. This lens' focal length range is obviously 28mm to 75mm. This covers the basic focal lengths desired in a normal general purpose zoom lens but might feel long to some 1.6x FOVCF users. For me, a 24mm wide angle would be better (common on many other zooms in this class), but 75mm on the long end is a little nicer than the common 70mm max focal length. A fixed f/2.8 aperture is as good as it gets in a zoom lens. The Tamron 28-75mm f/2.8 XR Di Lens will allow handholding and action-stopping until the light gets low. The f/32 minimum aperture will be useful to few as diffraction causes image softness to become unacceptable somewhere beyond f/16. With a minimum focus distance of 13" (33 cm), the Tamron 28-75 is capable of about .26x magnification - not bad. I really like the Tamron front lens cap. It allows the outside or inside portion of the cap to be squeezed for removal. The inside release allows easy installation/removal with the lens hood in place. Although it is a petty issue, I don't like the Tamron rear lens cap. It fits loosely and only installs in a single position (Canon caps fit snugly in three positions). However, it would not be hard to purchase a Canon brand replacement for this part. A non-camera body manufacturer brand, the Tamron 28-75mm f/2.8 XR Di Lens is available in Canon (reviewed), Minolta, Nikon and Pentax mounts. You should know that there are some potential issues with third party lenses. Since Tamron reverse engineers (vs. licenses) manufacturer AF routines, there is always the possibility that a new body might not support an older third party lens. There have been examples of this happening in the past. Sometimes a lens can be rechipped to be made compatible, sometimes not. Second, there is the risk of a problem that results in the lens and body manufacturers pointing blame at each other. However, Tamron USA's 6-year warranty is far superior to Canon's standard 1 year warranty. No lens is perfect, but the Tamron 28-75mm f/2.8 XR Di Lens delivers a lot for its price. The Tamron 28-75 would be a good general purpose zoom lens choice for 1.5x/1.6x FOVCF Digital SLR body owners unable to afford (or don't want the size/weight of) the Canon 24-70mm f/2.8 L USM Lens.